Recently, we were given the opportunity to review the IceMule. This is an insulated dry bag with a difference: designed to keep your drinks (or food) cold when outdoors. From a camping perspective, we give you our thoughts on how this works for a camping trip. If you have a dry bag (a great purchase for anyone who is in the outdoors), then the IceMule won’t seem to different, except that is an insulated bag, with the traditional roll top closure that gives you a watertight seal, assisted by the fact that the seams are not sewn together but welded. A plus about the IceMule is its portability. When empty, it folds down into its own small stuff sack. Anything that saves room on a camping trip is a big feature, as we all know how precious space is. There are a range of sizes available and they come with a padded strap so you can put the pack on your back should you need to carry the IceMule some distance to your campsite (or wherever you may be using it). This strap can be taken off should you not need it. ﻿How does the IceMule work? When you first get your IceMule, its all been packed up fairly tightly, so you have to let a bit of air into it, to help get it into shape. There is an air valve that you open to get the cooler ready for use. You can add extra air if necessary, but it did regain its shape very quickly for us, without us needing to add extra. Don’t forget to close the air valve! Now add your drinks/food and ice. You now FOLD down the top of the bag, twice. Pull the 2 top ends towards you, and snap into place. Your IceMule is now watertight, and ready for transport. ﻿Did it work for us? On our first review, we didn’t use ice but ice packs. The reason is that party ice bags are notorious for not lasting long in the esky, so we didn’t have any on hand to try. Bags of ice are frequently our last option for cooling food and drink when camping. The IceMule definitely kept the drinks cold and the ice pack frozen for the overnight trip. The weather was cold as we are testing this in a South Australian winter, so that is a definite help to any cooling system – lack of sun! Second test was with party ice. The ice did last about 24hours – but no longer. Our everyday esky/cooler that we use, if using party ice, we would generally not get much longer than 24hours from it either. I think for any cooler, the amount of times you open it, get something out, and shut it, is going to have a big affect on the ice and its lasting power. Where you place the cooler as well (in shade/sun) will definitely impact on the ice lasting. When the ice had melted, I sealed it back up as directed, and left it on its side, and waited for that slow leak of water to come out – but it never did! So that was a major test the IceMule passed. Probably wouldn’t want to put it under a lot of pressure by hanging it upside down full of water, but then again, who would walk around with a cooler hanging the wrong way, full of water? My answer – no one! What we noticed about the IceMule was how sturdy it felt. Not flimsy but with a strong insulated material. But its not a hard sided cooler, so some common care would be required to avoid any rips or tears to the IceMule. ﻿Who would the IceMule suit? If you are camping, it’s been recommended that you have drinks in one cooler, food in another (helps keep the food cooler longer as everyone who needs a drink, isn’t constantly opening up the esky to get it, but using the drinks cooler). We don’t do this because of lack of room. 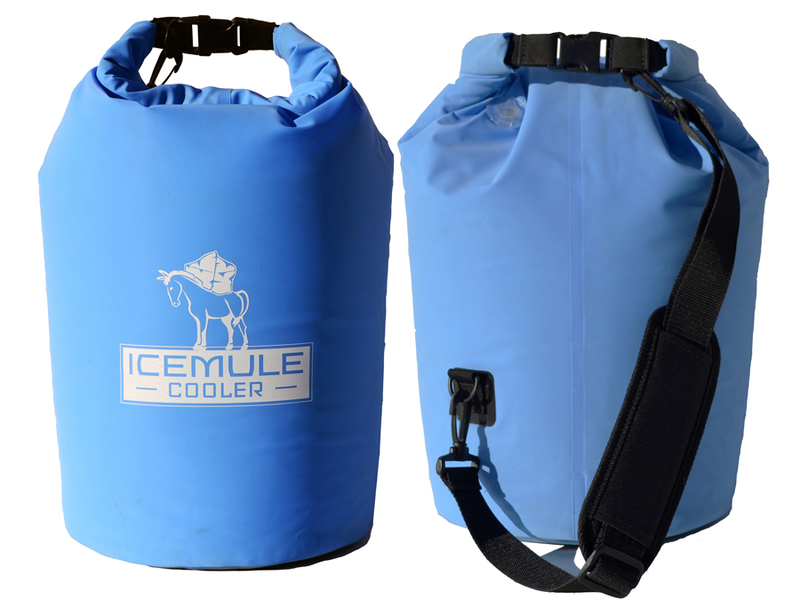 But this IceMule would definitely give you the option of having this 2 cooling system for your 1 night camp. If you are anything like us, we never have excess drinks left over from a camping trip, so the beauty of the IceMule is that, it can be rolled up, and tucked away when empty. On a picnic/day trip, this would be a worthwhile addition to your gear, especially if you are looking for something simple to store your food and drinks that can be stuffed away when no longer full. If you have to walks some distance to where you plan on dining, the backstrap could come in handy as a way of getting your cold drinks etc to the site (because carting a full esky to a picnic site is not always easy, going over bumps and up and down hills - so carrying your cooler on your back, makes sense, but keeps your hands free for other things). For overnight hiking, then we couldn’t take the IceMule because we are already carrying our backpacks, so we couldn't really carry another pack of any variety, but IceMule does have a range of coolers with the backpack strap system - probably not intended for overnight hikers, but more the person who needs to travel a bit to get to where they want their food and drink. Kayaking/canoeing fans – this would be an excellent addition to any outdoors trip, as apart from the fact it would float, being soft sided, means its more malleable and suited to being squashed in different parts of the boat. At the front of our kayak, a smaller IceMule would have tucked in nicely. 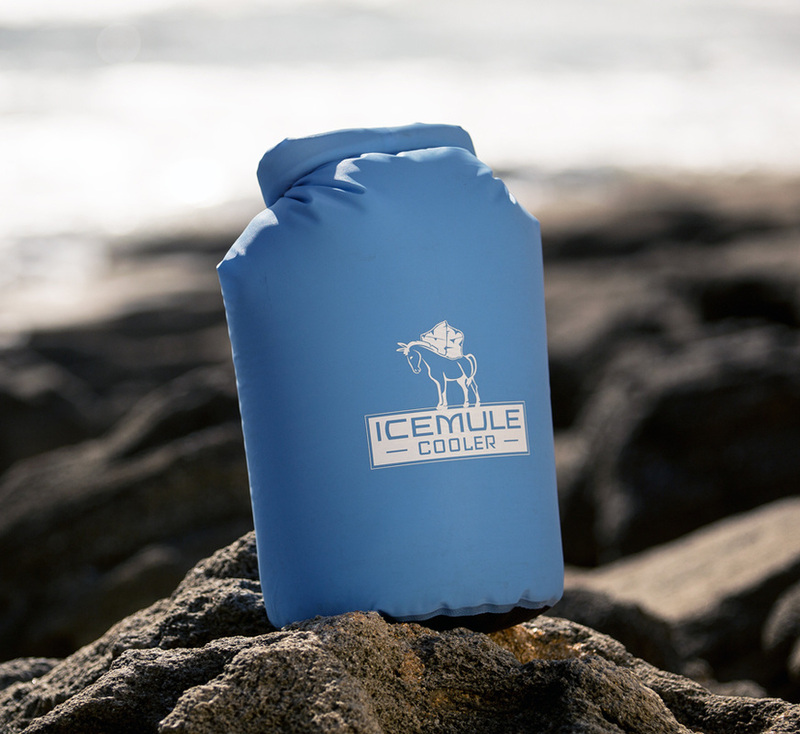 IceMule are targeting more than just campers with this product – they have an IceMule for the keen fisherman/woman, plus those people who need a larger soft sided cooler – up the 40L is available. Plus of course, the aforementioned backpack coolers. I think this is an worthwhile alternative to taking a hard sided cooler when outdoors. The quality of the product appears to be very high and whilst it's not a cheap product, you are getting something that should last if you take care of it. For camping, it provides an alternative for car campers who might want to use the 2 cooler system for their food and drinks on a 1 night camping trip (anything longer, then you would need to restock your ice). This product was gifted to Go Camping Australia for the purpose of this review. To find out how you can get your products reviewed, please visit our product review page.